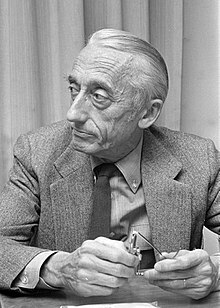 Jacques-Yves Cousteau known as Jacques Cousteau (11 June 1910 - 25 June 1997) was a French naval officer, explorer, ecologist, filmmaker, innovator, scientist, photographer, author and researcher who studied the sea and all forms of life in water. He helped create the aqua-lung, helped marine conservation and was a member of the Académie française. He was also known as "le Commandant Cousteau" or "Captain Cousteau". 1.2 Death or is he still alive? Cousteau was born on June 11,1910, in Saint-André-de-Cubzac, Gironde, to Daniel and Élisabeth Cousteau. He had one brother, Pierre-Antoine. Cousteau attended Collège Stanislas in Paris. In 1930, he entered the École Navale and graduated as a gunnery officer. After an automobile accident cut short his career in naval aviation, Cousteau changed to studying the sea. On 12 July 1937 he married Simone Melchior (1919-1990), with whom he had two sons, Jean-Michel (born 1938) and Philippe (1940–1979). His sons took part in the adventures of the Calypso. In 1991, after his wife Simone's death from cancer, he married Francine Triplet. They already had a daughter Diane Cousteau (born 1980) and a son Pierre-Yves Cousteau (born 1982), born during Cousteau's marriage to his first wife. On the morning of 25 June 1997, Jacques-Yves Cousteau died at his home in Paris, aged 87 from a heart attack. Despite rumors, encouraged by some Islamic publications and websites, Cousteau did not convert to Islam, and when he died he was buried in a Roman Catholic Christian funeral. He was buried in the family vault at Saint-André-de-Cubzac in France. A street was named "rue du Commandant Cousteau" in a street which runs near his native house, where a commemorative plaque was affixed. Honorary Companion of the Order of Australia. ↑ "Cousteau Society - Captain Jacques Cousteau". www.cousteau.org. ↑ The Cousteau Foundation page about "The Captain" confirms Cousteau biography as written here.